WASHINGTON, D.C. — Bryce Harper, a National League MVP at 23, is a free agent at 26, peddling his services in an industry that’s grown to nearly $11 billion in annual revenues. His combination of skills, age and marketing cachet make him an excellent fit for any major league baseball franchise. Particularly the St. Louis Cardinals. Harper, a career .279 hitter with 184 home runs, rejected a 10-year, $300 million contract in September from the Washington Nationals. Wherever Harper lands, the big-picture implications will far outweigh a team’s 2019 alignment. As it turns out, Harper fits in St. Louis now and later. His signing would displace the struggling Dexter Fowler in right field, though it won’t make the $50 million owed Fowler disappear. That’s OK – Fowler could assume a reserve role, reboot his career and take a crack at a starting job in 2020, when Marcell Ozuna likely departs in free agency. In the meantime, a Harper-Harrison Bader-Ozuna outfield gives the Cardinals a nice balance of power and defense. Ozuna hit 37 homers for the 2017 Miami Marlins, but managed just 23 and a .758 OPS in 2018, due in large part to a right shoulder that required a “cleanup” surgery last month. Assuming Ozuna is healthy, a Matt Carpenter-Ozuna-Harper pairing near the top of the lineup would be punishing. Harper’s presence and Carpenter’s versatility means the club could deploy young sluggers Jose Martinez and Tyler O’Neill in creative platoons – or deal one of them for depth elsewhere. Above all, they’d be buying Harper’s lifetime .388 on-base percentage and .900 OPS, sticking it in the middle of the lineup for the next decade-plus and working out the details later. As much as The Cardinal Way and the mythology surrounding it evokes an image of the selfless, noble organization where the whole (milk?) is greater than the sum of its parts, let’s be honest: The Cardinals love their superstars. From Hornsby to Musial to Gibson to Brock, to Ozzie, Pujols and Yadi, a club has stamped its imprint on a vast region of the country thanks to a gaggle of generational talents. And there’s about to be a significant void. Yadier Molina, a shoo-in to don the red coat of Cardinal hall of famer and a decent bet for Cooperstown, turns 37 next July, and his contract expires after 2020. While Molina’s still performing at an All-Star level, it’s not realistic to expect such returns when he’s on the doorstep of 40. Bader is a nice player, but with defense his primary calling card, not the sort around which to build a movement. Their top emerging players are all pitchers – Jack Flaherty, Dakota Hudson, Alex Reyes – with no slam-dunk positional superstars near the top of the minors. Stepping into this void would also have some appeal for Harper. It’s long been presumed he’d yearn for the bright lights of one of the coasts or a major market like Chicago. Heck, he idolizes old Yankees, hails from Las Vegas and has a dog named Wrigley. Yet none of those places provide the clean landing he could stick in St. Louis. Imagine signing with the Yankees, and possibly displacing Giancarlo Stanton, or trying to gamely share the spotlight with Aaron Judge. Imagine signing with the Cubs, and possibly being perceived as the guy who forced franchise icon (and Vegas pal) Kris Bryant out of town when he’s eligible for free agency. Imagine signing with the Dodgers and taking on all the expectations as the star for whom they broke the bank while they treat the rest of the roster like Tampa Bay West. In St. Louis, he’d have no such concerns, and for a good while be hailed as The Superstar Who Chose Us. That would allay plenty of initial pressure players face when switching teams. 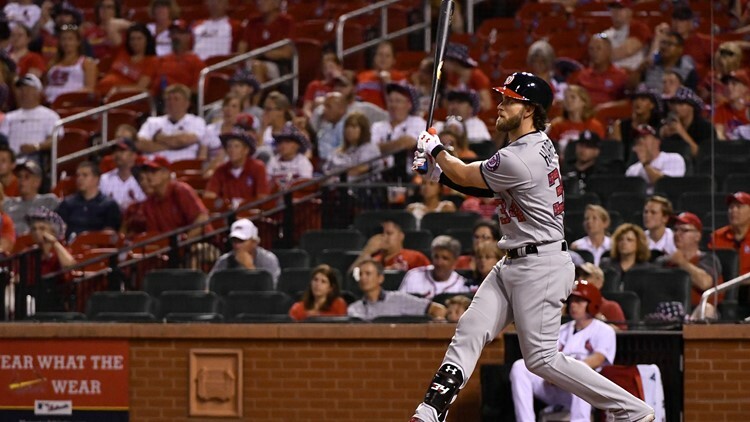 With a franchise value estimated at $1.9 billion and annual revenues approaching $350 million, according to Forbes, the Cardinals certainly have the cash. They also have a decent bit of financial flexibility. The contracts of Carpenter ($14.75 million), Molina ($20 million) and Fowler and Carlos Martinez ($16.5 million and $11.7 million, respectively) fall off the books each of the next three seasons, leaving only shortstop Paul DeJong’s team-friendly pact as a long-term commitment. If their young pitching continues panning out, that would buy further flexibility in the early years of the deal. Worth noting: Had Albert Pujols accepted the Cardinals’ reported 10-year, $210 million offer (in 2011 dollars, no less), there’d still be three years remaining on that deal. In that light, Harper’s contract could be viewed as found money, and for a player six years Pujols’ junior at the time of signing. Possibly – although long-term perceptions would have to yield to new realities. For the Cardinals, it’s the notion that it’s imprudent for them to tie up so much payroll - let’s say 12 years, $420 million – in one player. That they lack the financial muscle of the game’s big-market beasts. That they excel at finishing second but rarely winning the player – be it their own talents like Pujols or Jason Heyward or convincing a megawatt star like Stanton to come to town. For Harper, there are far more unknowns. Despite his occasional dropping of context clues – look, it’s Harper, Bryant and their wives, out on the town! – Harper has truly played this process close to the vest. What we do know is that before he was old enough to drive, he’s been riding shotgun with super agent Scott Boras. Bet on Harper getting exactly what he wants – be it a record-setting contract, a consistent chance to win, a return to Washington, a destination close to home. The Cardinals can certainly fulfill many of those desires.